Sports buffs know all about famous players and coaches and can recite statistics in endless detail. But do fans know how sport is linked to other institutions of society? Do they understand the role of sport in socializing youngsters in both positive and negative ways? What about the ways in which sport perpetuates race and gender-role stereotypes in society? How do owners, coaches, and other sport authorities exercise power to maintain control over athletes? 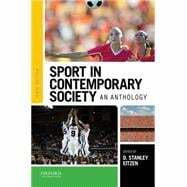 These issues and more are examined in Sport in Contemporary Society, Tenth Edition, a selection of accessible writing by journalists and leading scholars who represent a new era of critical appraisal of sports--both professional and amateur. D. Stanley Eitzen is Professor Emeritus of Sociology at Colorado State University. He is the coauthor, with George H. Sage, of Sociology of North American Sport, Ninth Edition (OUP, 2012).